Back in the ‘70s my parents and I took a trip to Hollywood and I got a book about this guy named George Barris. It was called “Cars of the Stars” and detailed his extensive career making cars for the movies like the original Batmobile. I was really taken with the cars in the book even though all those movies and TV shows appeared before I was born. The book was pretty influential on me because he was the first guy I ever heard of who made a career out of customizing cars and I still have the book today. In it is a picture of George’s office and on his book shelf are all of the kits AMT made of his cars. I always thought it would be neat to try and track down some of those kits and build them. Over the past few years RC2 has re-issued a few of these old AMT kits and most haven’t been available for 30 years. 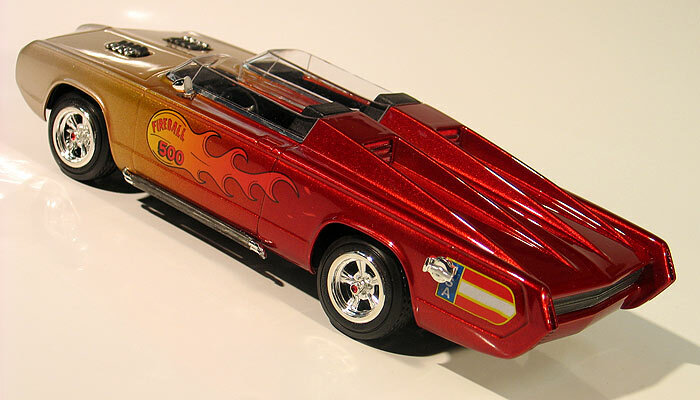 One that caught my attention when it was reissued was the old Fireball 500 kit so I bought one and decided to build it. The history of the real car is kind of interesting. 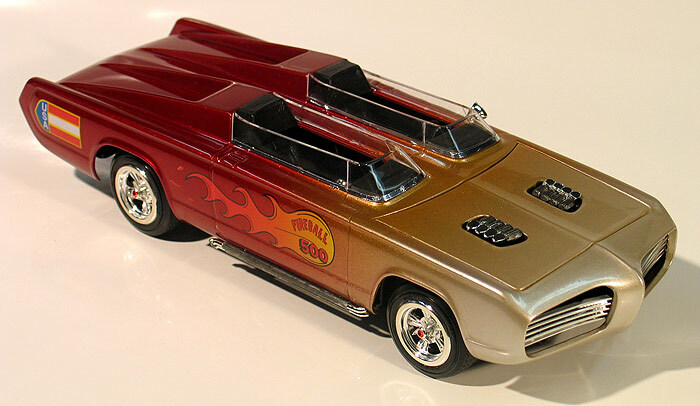 It was based on a then new ‘66 Plymouth Barracuda and built for the B movie race car flick “Fireball 500” starring Frankie Avalon. Although the book I have does show pictures of the car they were all in black and white. A quick search on the web turned up two paint schemes of this car. The first version which matched the pictures I had in my book showed the car with a paint scheme that faded from candy red at the back to gold in the middle of the car to pearl white at the front. My pictures show this version on a sound stage with Frankie at the wheel so I am presuming that this is the film version. 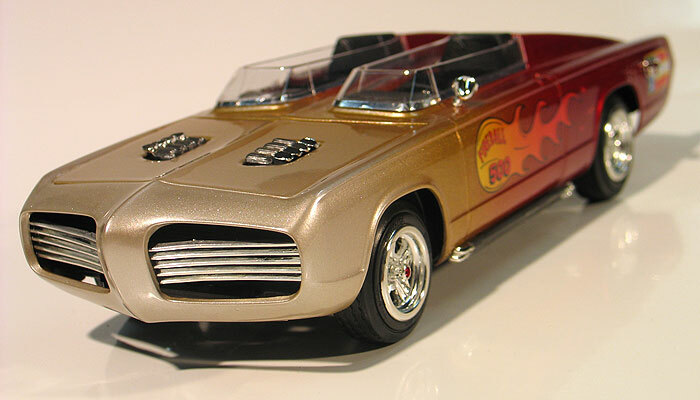 The second version I found shows the car painted candy red and fading to solid white across the front without the gold. There are also some other detail changes to the windscreens and slighty different graphics were added. I am guessing that at some point the car was repainted and put on show tour duty as most of Barris’ cars were done with in the ‘70s. 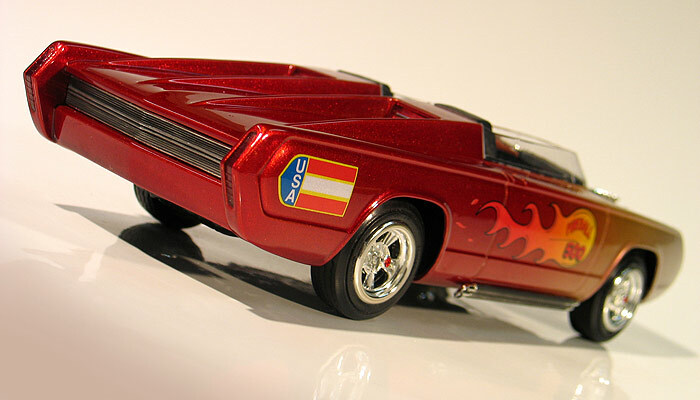 The decals that come in the kit represent the later show car version but after comparing the photographs I decided I liked the earlier film version better, so my model ended up being a combination of the two. For paint I airbrushed a base coat of Duplicolor primer followed by a base coat House of Kolor Pagan Gold. Next I airbrushed 4 coats of HOK Candy Apple Red over the back half of the body and then airbrushed 4 coats of pearl white over the front half. After applying the decals, a final coat PPG Concept2000 urethane clear finished off the paint job. I wanted to keep this build pretty simple the rest of the kit was built straight out of the box. I find these old AMT kits really fun, easy to build and they bring back a lot of childhood memories.